How to import from a ShipStation CSV file? 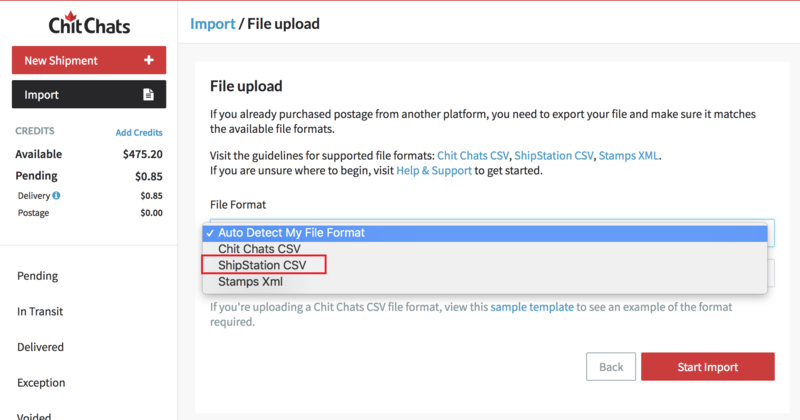 If you purchase postage through ShipStation, here’s how to get your shipments into your Chit Chats account. Go to your Shipments screen. 3. Select your desired shipments. Alternatively this can be done at the import step. Important: If this option is not selected, orders containing multiple items will not be captured! 5. When asked which records to export, make sure “Export All record(s) in the current view” is selected. 6. Under the "Shipped Items Export Format" heading ensure Shipped Items Export is selected. 7. Save the file to your desktop or somewhere you can easily locate it. Log in to your Chit Chats account. Note: You may also select the Auto-detect option however, file upload errors messages may not be as accurate. 4. Click on "Choose File" and select the exported ShipStation CSV file. 5. You will be prompted to review a list of the file's shipments. From here you may decide to import all shipments or just a select number of them. 5. When you are satisfied, click on Import and your file will be uploaded to your pending shipments. If you experience errors when uploading your shipments, or have any feedback that you'd like to share about this feature, please feel free to contact us.